In one harrowing recorded vignette from the massacre, a merchant who had brought his two sons to the games begged the soldiers to kill him but spare his children. The Goths agreed to save one of the boys, but the merchant was told to choose between them. "The father, weeping and wailing, beheld both of the two sons and committed to choose neither, but rather continued being bewildered until the time when they were killed, succumbing equally to a love of both." At least seven thousand killings later, the soldiers' work was done. The slashed and beaten bodies of men, women, and children were left strewn around the stadium to rot in the Greek sun. The news of this horrible murder of Roman subjects sent widespread, intense shockwaves throughout the empire, in no small part because Theodosius was known for his Christian mercy. The emperor was wracked with remorse, but the deed was done. Enter Ambrose, the bishop of Milan (and later saint), who was familiar with the emperor's mood swings as well as the intensity of his present grief. The bishop refused to receive Theodosius personally. Instead, he confronted him with a letter threatening to withhold the Eucharist—and thus the emperor's salvation—unless he excommunicated himself or did penance. "I dare not offer the sacrifice if you intend to be present," he wrote. "Is that which is not allowed after shedding the blood of one innocent person, allowed after shedding the blood of many? I do not think so." Never before had a church official had the cheek to demand public penance from a Roman emperor. Yet Theodosius had no choice but to submit: His soul was at risk. In an unequalled display of self-abasement, the "Ever-Victorious, Sacred Eternal Augustus, Lord of the World" put down his regalia and could be seen weeping and groaning on the cold stone floor of Milan's cathedral. After eight months, Theodosius was allowed to take communion, but his soul had been saved at a colossal price: The empire had lost a critical contest of prestige with the church. Ambrose soon pressed his advantage, pushing Theodosius to step up the repression of paganism and ending any pretense of Roman toleration of pre-Christian religions. In little more than a century, all male homosexual behavior would be officially classified as an offense against the Christian God, and forbidden on pain of death. 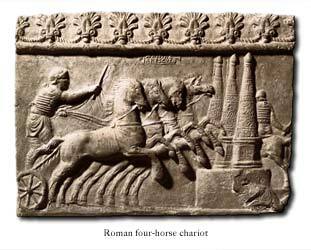 What had begun as the arrest of a provincial chariot racer resulted, in just a few months, in a turning point in Roman and Christian history. The fate of the nameless charioteer is unknown, but it is a safe bet that his glory days were numbered, as were those of the ancient pagan religions.